Clarrie’s Pig Day Out by Jen Storer & Illustrated by Sue de Gennaro is a newly released Children's book, aimed at kids aged 3 and up. Clarrie is a busy Farmer, who just can’t seem to get his words right! He says jar, when he means car; and hoot, when he means toot. He tries very hard, but it takes him a few tries to finally get his words right. In Clarrie’s Pig Day Out, the Farmer has a particular busy day, where nothing seems to go to plan. His Dog - Bert, doesn’t seem to listen to him; a box, or rather - Fox, almost hits his car; he ‘roasts’ his letters at the ‘roast-office’; he chases his chickens who have escaped from his car; and after more adventures, he finally gets home after a very ‘pig’ day. Jen Storer, author of the best-selling ‘Truly Tan’ series; has created a fantastic story-line, incorporating rhyming words, educating children in a very humorous style. Children will love this funny book, and the opportunity to correct the words that Clarrie has used mistakenly. The illustrations by Sue de Gennaro are wonderful and bright, and really bring the words to life. 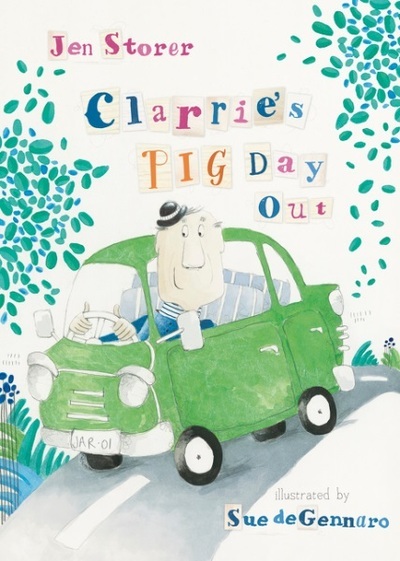 Clarrie’s Pig Day Out is available to buy now.